Happy Tuesday! I have not stopped smiling for Javaka Steptoe, Vera Brosgol, R. Gregory Christie, Carson Ellis, and Brendan Wenzel since the ALA Youth Media Awards press conference ended on January 23. Click here to watch the ALL Youth Media Awards. I asked this year's Caldecott winners to answer two questions and finish two sentence starters. Today is Brendan Wenzel's turn to shine. Thank you, Brendan! Congratulations, Brendan! Everyone loves hearing about THE CALL. What ran through your head when the phone rang? What were you thinking about when the Caldecott committee was clapping and cheering for you? Brendan Wenzel: I was in Brooklyn, and groggily making my wife a cup of coffee. When my phone went off, and I assumed it was my morning alarm reminding me to move the car. Weather-wise, it was not the nicest morning, so it was not a particularly welcome sound at the moment. I was reaching out to hit snooze, and then I realized the buzzing was a call from Atlanta. I knew the ALA was being held down there, so immediately put together that it was either good news, or someone was playing an extremely cruel joke on me. Picking up and hearing the committee cheer and shout an enthusiastic hello when I picked up the phone, was a very sweet sound indeed. 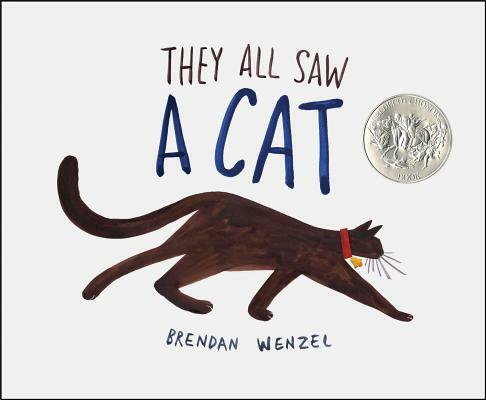 Brendan Wenzel: Making a book, and then having it resonate with a reader, is an experience that is humbling and heartening beyond words. No matter their age, knowing that a book I’ve made has connected with another person, makes me feel and on some level understood. When a project resonates with folks who spend so much their time with children and books, and who care deeply about reading, and the combination of pictures and words, it is even more overwhelming. In short, I’m honored. This year was packed with fantastic books, and I feel very fortunate the planets really aligned for me here. If there is one message, I will try and take away it is - just keep going. Reading is a remarkably important practice that should be available to all people- especially children. School libraries are magical places. Borrow They All Saw a Cat from your school or public library. Whenever possible, please support independent bookshops. Brendan, it was a pleasure and honor getting to meet you at Books of Wonder, and I was sure this book was headed for a medal. Congratulation! :D And "Yay!" that Emily made a song!! !